I love this verse! Isn't it a cool quote? Well, this ayah is actually explaining about war and jihad. But without taking the meaning of this beautiful verse out of context, we can still take it as a general reminder in our daily life, don't you think so? Like when we are given 2 choices in life, but we just have to choose one, especially when we end up with the less favorable one. Or perhaps when we are not given any choice at all, but to just accept whatever is in front of us, whether we like it or not. Just like what is happening to us right now, where we're being tested with grief and loss. From the LMP, I was supposed to be around 13 weeks/3+ months pregnant, which I just past my 1st trimester. But since I am using a mobile app. called FLO, I think I might be approx. 2 weeks late from my LMP, which means I might be around 11 weeks pregnant. 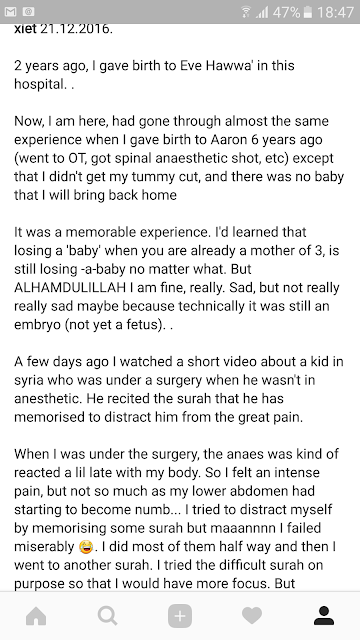 Subhanallah, that means, I got conceived during my infertile day, only a few days before my next cycle! "KUN FA YA KUN"
So we concluded that maybe, just maybe, the baby had stop growing during its 6 weeks. Only that it didn't flush itself out naturally, and my body was still supporting the pregnancy all the way (I'll explain later on this) - This is called missed abortion. Our first maternal check up was on 27th NOV 2016. The doctor did an intervaginal scan and discovered a small empty sac in the uterus. That's all. But at least I knew I was Pregnant. Second check up was 2 weeks later (11th Dec). There was something like a round shape in the sac, a fetus, as verified by the O&G. According to the LMP, I was supposed to be 11 weeks pregnant, but from the scan, it was just about 6 weeks. Obviously there was growth in the sac as compared to the previous scan. But ironically, the growth wasn't proportional to the LMP by huge interval. Another problem: we couldn't detect the heart beat. "We just wait and see.... I am not sure what kind of pregnancy I am dealing with" - O&G. The words that I will remember for as long as I think I would! I thought the bleeding would stop. I was wrong. I continue to 'bleed', but this time just a brownish discharge. I was contemplating whether or not to make any appoinment. I seek consult from a few doctor friends. Since it was a brownish discharge, they said don't worry too much, have rest! just please have rest! bed rest if I can! and please go to the hospital and get myself checked if there's anything that concerns me. Unfortunately, I started to bleed fresh blood on the 17th night. On the 18th, I tried to make an appoinment with my O&G, but she's full. I ended up with another O&G on Tue (20 th), though I'd had my next appoinment with my O&G on the 22 (Thu). And that was when we confirmed that the baby was gone, like officially gone. I was bleeding fresh blood, the fetus got no heart beat (Still) and the round shape in the sac was shrinking. The next day (21/12/2016) I was admitted to the hospital and was ordered to do D&C.... How did I feel? Like my post in my IG. It was hurt. I was hurt, physically and emotionally. But Alhamdulillah, I am fine. -A normal-gentle birth (minimal medical intervention i.e, VE and AROM only, no pain relief)- Eve. -D&C -(supposed to be) baby no. 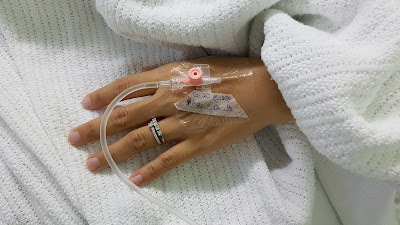 4... with an anaesthetic that kinda react a lil slow in my body, hence, I felt an intense pain, I felt the suction, the cramp, the intense pain! -I had previous miscarriage with just a natural flush out also. And now, I am fine. Alhamdulillah. My uterus is taking its time to heal completely (pain is becoming lesser, womb is not swollen anymore). However, the spinal injection site is still hurt (bruising maybe), and I am suffering back pain in various places (the effect of anesthetic, plus I'd had an epidural 6 years ago, and yes, aging factor, I knowwwww). 1) you know some women will have difficulty to BO after delivery, Yes, I kind of having a hard BO (almost constipation), surprisingly, even though technically I didn't really deliver the baby. Maybe because I still had the cramp/contractions especially during the D&C process itself. 2) I am producing milk and I got engorged - - -, hurt!!!! this is even more surprising because I thought I was just having a missed abortion! (but that also make sense cause missed abortion is a missed misscarriage - the body didn't recongnize that you are misscarriage, hence the placenta keeps on producing hormones. Anyway, there are a lot of underlying stories I don't tell. -About why I didn't straight away go and see the doctor. -About how I actually had a sense that something wasn't right due to some symptoms i.e. I had bad pregnancy symptoms mostly sickness. I got that a few days after London trip and I even made a 'scene' in Bahrain Airport (That's where I suspect I was pregnant) but I suddenly didn't feel nausea. I thought this time the pregnancy would be different... and in some way, yes, it was different. -Why I didn't get bed-rest as suggested and why I can't afford to have confinement post-incident. But it's OK. At least. I'm writing up the most important parts. On how I want it to be remembered. And the most important part is, we are all fine. Alhamdulillah. Eve, well, she's still small to understand about loss, about death. Sometimes when we lay down side by side, she would rub my belly and say "Hi baby, Hi baby" and sometimes kiss (more to sloppy kiss) my belly. She did that even during the night before the surgery. That one last night with the baby in the belly. But I'm sure she'll be fine. I learned that, dealing with loss, regardless of any kind, is a great emotional trial. Alhamdulillah, I am surrounded with good friends and families. So yeah, that's all about it. Almost all. Haha. I hope, this is one of the way Allah wipes my sins away. Ameen! Only hubby and me. One more ticket for mom tapi dia asthma time ni. We sengaja tak allow sesiapa family member nak datang kalau takat tunggu2 luar sebab nak cepat. haha. Macam tanak konvo je kan. I went back to Malaysia twice to settle my thesis and study. The first time was just after a few months in Oman, as soon as I finish my drafts for 2 chapters. I didn't take long Alhamdulillah after the hard head start. No choice but to go back to Malaysia to make discussions easier. I then decided to stay until I complete thesis submission. Sounds nice, but of course the kids followed me. So basically I had to face the exact same thing i.e. a single mom, student, and a thousands miles away wife! But family members were always there to help. I can't thank them enough, really. I submitted my whole thesis after 2-3 drafts for each chapters. Each one with different corrections from both supervisors. The most challenging part in this phase was always to find agreement between all parties. Hahaha. But that's one life lesson worth to keep. For all that I'd been through, I thought my thesis would end up as a piece of crap. How can I produce a Scientific Thesis with a quality like this? I can't imagine how screwed I'd be when my supervisors and all the examiners read my work. But Alhamdulillah, I passed with only minor corrections! the correction that I took about less than 3 weeks to amend. 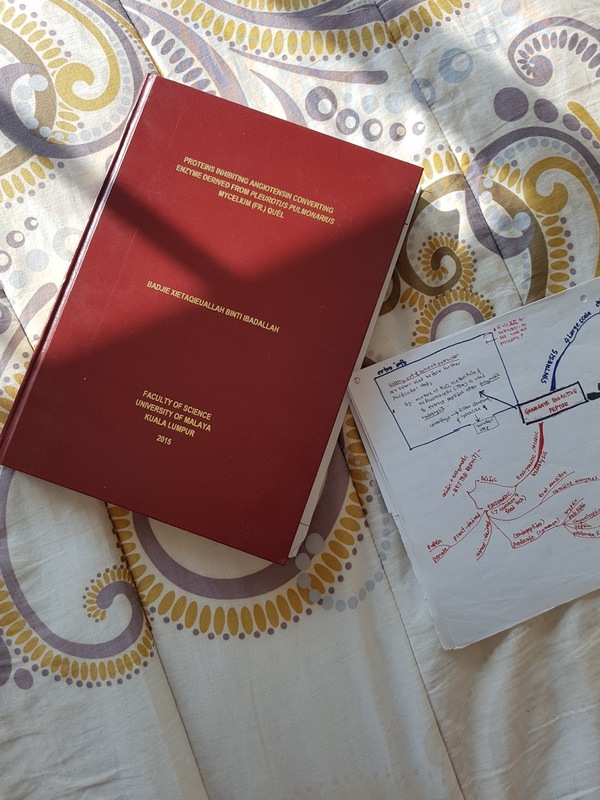 My baby, and a piece of notes I did during my early years of study. Still keep it. So now, is the article publication part. UM has the requirement where a Master student must publish at least one article to ISI-listed journals only. And based on my labwork grant, I have to submit to either Q1 or Q2 listed jounals only. For those who's not familiar, scientific journals are divided between Quartile 1 until 4 based on its ranks and Impact Factors, with Q1 being the highest grade (I'm not sure other fields but this applies to most Science and science-related field). 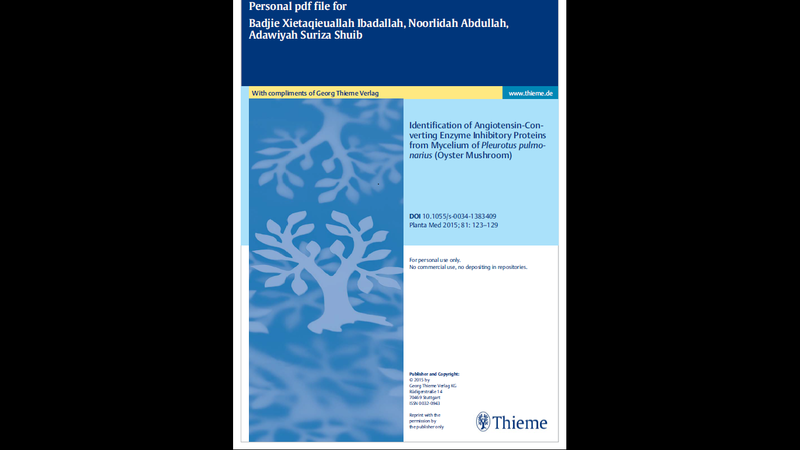 So although I had already submitted my thesis and the internal and external examiners had let me pass, I can't straight away graduate until I have a publication. My supervisor's strategy was to target the Q1 journal first. 3 attempts and all failed, I begged to her to downgrade to Q2 to make my life less like hell. Haha. I promised her to look for a decent Impact Factor (IF) although it's a Q2 (politics mannn, haha. and It worked!). Alhamdulillah, the 4th attempt of paper submission, which was my 1st attempt of Q2 journal was successful. Not so bad huh. Not bad at all. Oh butttt... you have to wait for sometimes to get a reply (depending on the journal's prerequisite). It can take up to a month and can even reach half a year or more just for a journal's reply! So, I learnt the hard way. After the 2nd failure, I didn't just opt for journals that have good IF, but also how long it'd take to process your submission. Average waiting was 2-3 months for each trial, regardless of the result; accepted or rejected! From my experience, only one of them managed to reply within a month and half. So altogether, almost a year of just waiting for paper and nothing else. Another tips for Science student: Always try to submit your paper once you got your result done! That's why there's no last minute work dude! You got your result, do discussion ASAP and you can try to submit a paper. You'd never know how long you'd take to get it accepted. Mine, I got my paper accepted a week or two before I delivered Hawwa! It felt like I got two babies at once. Haha! I emailed my sv asking permission to hold it until I deliver. UM gave 3 months for final correction and since my correction was just minor she didn't worry much. I flew to Malaysia when baby was around 40 days old. Again I brought my off-spring to be my companion in my jihad, but this time only one- the latest bundle of joy. The other two were left with dear husband. I knew the fact that I can't take a lot of time because husband can't take long leave. I made a dateline to make it maximum 3 weeks, and Alhamdulillah, after sleepless nights and days, we made it within 2 weeks’ time. 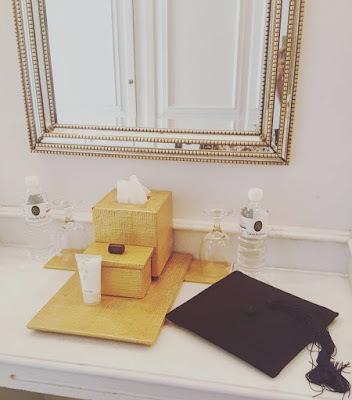 But I had to wait again till end of the year to graduate (the ceremony). I don't care at all. You know, after all that you've been through, getting things done is the biggest relief. What a sum up! Haha. ZzzZzzzzz. So again, is it possible to study (especially the fields that require research and labworks) and being a mommy? Of course! But please dedicate your time for your study, like what I said in Part 1. And it doesn't have to take so long like my case. A lot of people (moms) out there have succeeded within the anticipated years. Everything we do has its own challenges. To be realistic, yes it's difficult. It takes a lot of courage and determination to do it. But again, it is not impossible if you want it. It is my destiny to have this path, to be tested stage by stage, from cutting scholarship before the agreeable due time, changing of research methodology after a year of research and labworks hence the wasted data, long distant relationship with husband, to having health issues. If my life was so easy, maybe I'd not be who I am right now. I may not appreciate hardships, I may not treasure 'Ilm (knowledge) as much as I do now. Indeed, Allah knows best. I can't thank enough to the people who have helped me throughout the journey. They were indeed the reason I succeed, of course by the wills of Allah. And I can't deny I had relinquished a lot of my parenting responsibilities along the time I'd taken to finish my study. That's why, in this particular event, Aaron is so special in my heart because he had sacrificed a lot for me. And now that I am a full time Rabbatul Bait, I am so happy to spend my whole time with my family. No regret, in fact, truly blessed! Alhamdulillah. If you haven't read part 1 yet, Please click here . The early life in Oman was challenging. We were definitely happy to be together, but at the same time the pressure was more intense. So intense that it had affected me and my being. My small family had almost lost my cheerful part in me. The unsettled business was bothering my life! I made a decision to stop my study half-way after 3 dormant months from thesis writing. I seek consult from my husband and my close labmates. All of them let me made my own decision but they were all a bit bias to wanting me to finish my study. "You were almost there! Just two more chapters to write!" that's what they usually said. I then decided to just go with the flow. It was really, really hard at first because I need to get myself familiar with all the terms again, get back the writing rhythm etc. The hardest part was always to juggle between being a full time stay at home mom and studying. Most of the time I read articles and writing up thesis in between chores, play time with Aaron and generally everything else. I even wrote thesis (typing) one hand while holding my baby girl with another hand to nurse her. It was slow and I almost got lost of idea half way. Haha. That time Aaron hadn't yet go to school so you know how hard it was with a 3 years old and a baby in the house. Whenever he demands attention, either one of us would get frustrated. He, because I didn't pay attention to him and just pretending like I was listening while obviously I wasn't, and me because I can't concentrate. At the same time, I was tested with health problem. I had problem with my left hand, which was diagnosed as Carpal Tunnel Syndrome. I can't barely move my thumb, and can't even move my wrist without great pain! Sometimes my hand would have a 'traffic jam' as Aaron called it, a condition where my nerve suddenly felt stuck, like having a spasm or cramp, with a stiff pain that I normally can't stand but to scream or cry instantly. It got worse in the morning as that's the first thing I had to deal with the moment I woke up. It took me nearly a year to fully recover. So hmmm. And yeah, I am a lefty and I had a toddler and an 8 kg baby to take care of. Alhamdulillah sometimes I had my sisters with me. My husband asked for their favors to facilitate my affairs. At least I can have one baby with me and Aaron can play with them. Although you know, kids will always want their mom when they know their mom is around. At least someone can help with simple chores like cooking or washing dishes and did the laundry. They were so helpful they didn't act like a guess and didn't just lock themselves up in the room and play phone all the time. They helped willingly not just based on their mood. In fact, I didn't even have to ask for help! Barakallahu feehunna. Well, a piece of advice, especially for a MOTHER: PLEASE, if you want to study, please arrange a special time for yourself to study. Make it like an office hour like 9am to 5pm to just focus on studying, or at least half of that time, everyday! You need that, trust me. In fact, that is your right as a student. You can have the rest of the other time in your 24 hours to be a mother, a wife, or whatever hat you have to put on. I didn't have that privilege. So I had to have strategies. BUT...I honestly didn't really have any! Hahaha. Except, just as what I have mentioned earlier. Only, normally on weekend (Thursday and Friday) nights, I would stay up all night to write, and only sleep a few hours after Fajr Prayer, or until my baby needs me.Why? Because my husband was not working on the weekends so at least he can take care of the kids while I took my nap. That's how I did it. Not fancy at all. Hahaha. OK. I'm getting too long now. Let's continue part 3 here . Two of my sisters are graduating this month! Congratulations. Brakallahu lakuma. Last year, my other sister and I shared the same graduation year of our Masters Degree. She's in education, I was in Science. ...A celebration I'd rather choose to ignore at first. If not because of my husband who insisted we went back home and attended the convocation, my plan was to go for a vacation nearby, within Muscat is fine, and celebrate it just the 5 of us. It seems not worth the money to just go back for a day event all the way from Oman. But he insisted, reason being, I had worked hard for it, and it had given tremendous impact on our small family- The obstacles, tears, and sweats, the sacrifices, etc. But Allah had a better plan for us. 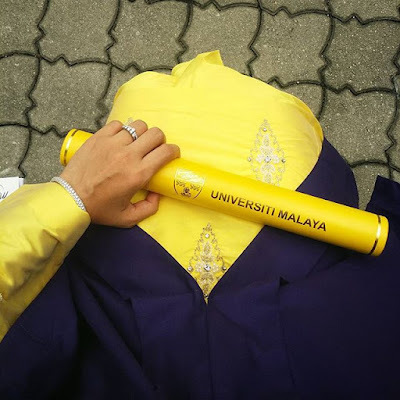 My husband was given a task in Malaysia for a week, and my graduation day was happened to be on Saturday morning the same week. We flew back to Oman that Saturday night. You know, I've been wanting to have a special post about my master journey. I've been dreaming to write about everything precious along the journey and mannn I've waited for so long! Even if I have the highest education certificate the world can offer, I am still a mother and my kids are my priority. I've been asked a lot of time how was it possible to be studying and taking care of children, especially towards the end of my Master journey where we were miles away from my school and family and without a helper. All at once. How did I do that? People around me either think that I am a supermom, or a pathetic (not so) young woman who's trying soooo hard to fulfill her dream (or just say finish what she has started long ago). To say that I had no helper at all is actually not precisely correct. Honestly, I could never in million years finish my study without the help of people around me, directly or indirectly, especially some of my labmates and my own family members. I took care of Aaron in his 1st six month. I took a semester break. His Onni took care of him after that during the time I had to go to school and did my labworks. In the weekends, my husband helped take care of him or all of us would have a party in my lab. And when I was in Oman, some friends helped with the admin stuffs. Ijah, if you read this, I want you to know that I owe you so much! Barakallahu feeki. During school holidays my sisters will take turn to come over to our house in Shah Alam to play with Aaron and helped me with chores. Having them in the house had made our days (especially Aaron) brighter. At least some one can play with him while I was busy in my own journal-reading world. During my second pregnancy, I was miles away from my husband for almost a year. Life got tougher without him especially when juggling between motherhood and student life. I had started writing my draft while still doing my labworks (few re-arrangements and last minute changes I can't avoid). And my pregnancy symptoms were really bad. Nevertheless, I still had to go to the lab in the days and stayed awake most of the nights for writing. I slept for about 3-4 hours most of the time. With that and my pregnancy condition, mannn I was over-exhausted. During the first few months of my LDR with my husband, Aaron was in the phase of weaning off . It was hard, really hard until my dad tak sampai hati and a lot of time asking me to just abort the mission. He was around 2 years and half and I was around 4-5 months pregnant so like it or not, I had to go ahead. I was trying to potty train him as well and I just couldn't take the stress out of it, so I aborted the potty train mission. But this time the challenge was harder because I had two children already. I had to be very strict with timing. No lunch break most of the time and straight away home after work. But you know labwork, sometimes it takes a solid 6 hours for just an experiment! And some even take days to get just a result. But yes I didn't go on everyday basis. a general term for disorders that involve difficulty in learning to read or interpret words, letters, and other symbols, but that do not affect general intelligence - (Source from Google). To understand a bit more about dyslexia, please click here for a simple and precise explanation. So what's up with dyslexia? Al-kisah, ada lah seorang emak tu, tak tahu lah apa masalah dia, tiba-tiba dia datang dengan satu teori konspirasi yang menyalahkan genetik sebagai punca anak dia tak reti membaca lagi pada usia 6 tahun. Iya, 6 tahun, bukan 16 tahun ye. Come on Ummi, he's just 6. What is your expectation? Well, well, of course I have expectations. At his age now, I want my son to be excellent in reading, spelling, and maybe he can even be an orator like his dad. I want my son to be able to write neatly, even in cursive handwriting. I want him to understand the Quran, memorize it and be able to speak fluent Arabic. Is that so hard to ask for? DELUSIONAL! You might as well want your son to be the youngest mufti or a prime minister! Yes, seriously. Plus, with all the miss-spells (Hi, mi nam is Aaron, tac u) and don't forget the letter reversal. b with d, 2, 3, all terbalik, despite he has known alphabet by heart since he was like 19 -20 months old! Yes he has that special power, I should be proud! What, you can read what he wrote too? So you are saying that your son is dyslexic? No. I am just... you know, worried. I am worried if I just ignore, being denial without in a second have the thought that he might be one, and I just don't do anything about it. Or at least look at this in a different perspective. I am worried if all this while, deep inside my dark side, silently accusing him of being lazy, don't want to try harder and urrmmm, being lazy, especially when I was angry at him during homework time, is me, being way wide of the mark! I am concerned, because I want the best for my kids. Dyslexic is NOT a disease. It isn't a situation where your kids will not know how to read for the rest of their life. Dyslexic people can be as successful as non-dyslexic. Most of them behave and act normally, just like anybody else (unless maybe they have other issues). But Alhamdulillah, after some thorough readings and consultations from my fellow doctors, as well as looking at other signs (like he's able to read simple Arabic since he was 6), I learned that this confuse thingy is normal at his age. I don't need to worry so much, but still have to monitor, because if he is still like this even long after his 7th birthday, than maybe he needs to be taken seriously. Man I am just an ordinary human being who has experienced motherhood for 6 years, but still sometimes being so naive about what motherhood is all about. If you ask me, honestly, I have a dream that my kids are fast learners, that they can read as early as 5 or 6, just like I did. And that they can spell and write and read Quran slowly, if not properly yet. Eh, macam expectation kat atas tu je. Sah, perempuan ni delusional! But I don't compare my kids with others (except for just to ask whether it is normal at his age to have such issues). I know some kids his age have already self-read, memorize Juz 'Amma and maybe even good at simple arithmetic, congratulations to their parents! I realize one of the hikmah (that I can think of) for facing this phase is that, Alhamdulillah, it's like I am being reminded constantly that "You can try your best, but remember, you don't have control over certain things in life, because everything, including our abilities and disabilities, is in Allah's hand. I am being tested with my act towards kindness, compassion, and most importantly my patience. And indeed, compassion eliminates prejudice. So in conclusion, if you are in the same boat with me, or if you have a dyslexic child, let us pat ourselves on the back for our endurance on facing the challenges, and let us make du'a so that Allah facilitates our children's journey in seeking knowledge. Aaron: To stay or to change? OK. lets go to some boring history. 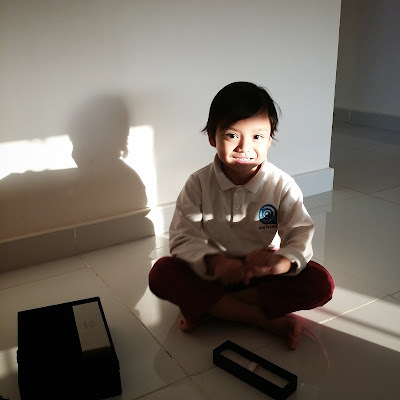 When Aaron was in Kindergarten year (KG), we were happy with his school and the system in general. Aaron had good exposure in both English and Arabic because in KG years, the system goes by swapping Eng-Arabic class in alternate days. During English-day class, they will go to their English teacher and for the whole day, they'd have English as their main medium of communication in class (with the teacher and throughout their simple routines). It also applied to Arabic-class day, except for English, Science and Math subjects. Due to mixed nationalities, the Arabic teacher will give translations whenever necessary. Overall, We were satisfied with KG year. We built good rapport with Miss Fatima (her homeroom teacher) and Aaron was happy to go to school. 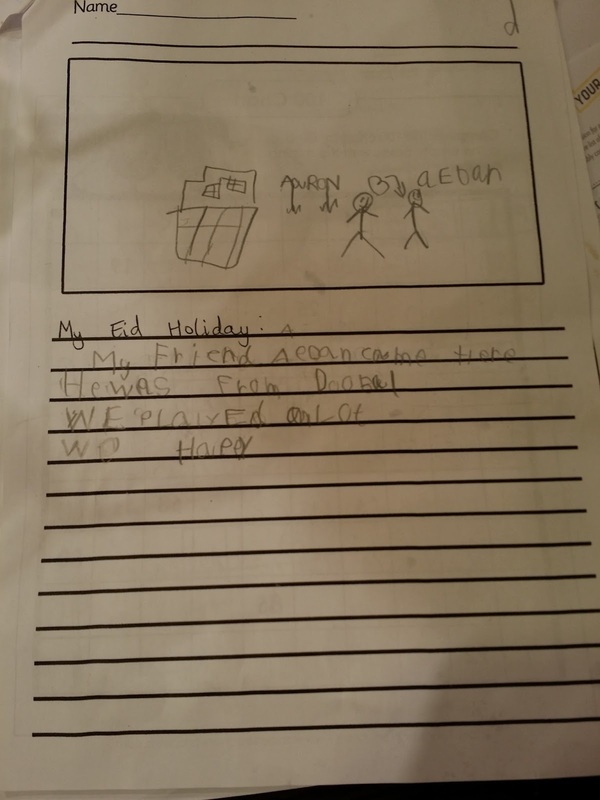 I was not really keen on the homework concept because they were just 5 years old but I can't make big fuss about it since I think most parents think the other way around (more work and homework means more learning and that's good). Well, that's personal preference, nobody's right or wrong about it. Anyway... By the time he finished his KG 2 (he skipped KG 1 as it is not compulsory), he still wasn't able to read. I took it as it is, coz for me he was still small, and I know that kids develop interest (and milestone) at different pace. We're fine. So what had he achieved than? 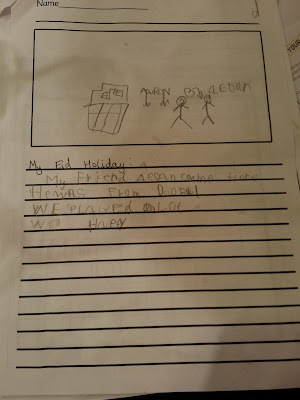 All this happiness... changed instantly when he was in Grade 1. The school starts its 'separating system' starting from Grade 1. All expat students (non-arabic speakers) were to be in the same class. (And we didn't know about this earlier!). So, he didn't have as much exposure in Arabic anymore. Though we're not happy with it, but we understand the school's concern i.e. to make learning more convenient for both teacher and students. However, in reality, things did not go as it is. 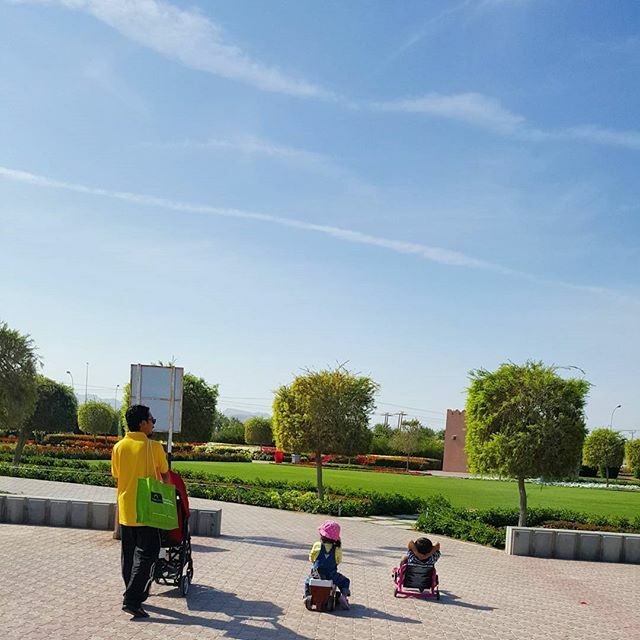 Our kids were put in an experimental phase whereby they kept changing methods and I later found out that they even have problem to find a suitable teacher for the expat students. Whatttt?! And not only that, the muslim students were expelled from Islamic Study somewhere during mid-term, with the same reason; book is in Arabic, and no suitable teacher that can teach the expat students because they are mostly not fluent in English. And of course I got this info from a teacher there (we became friend), nothing from the management. This, has made us even angrier! No wonder everytime I checked, he didn't have the book. I thought they have to keep the book at school, but then everytime I asked Aaron what did he learn, he said no IS. OK that was last year. I have convinced my husband to change school since then. Actually almost all International schools here have the same system i.e. Non-arabic speakers have to take Arabic for beginners, or some even have no long-term Arabic. But there are schools that don't separate the students. Nevertheless, at least no hassle like this. My husband said it is not easy to change school. Plus, something had came up last summer that had changed our big plans, including hajj and school. OK then, we give it another chance. They may have already settle this issue over the summer. Heck we were wrong. Last 2 days we had a parent-teacher meeting and the same problems were being raised again. Not only from me, but most of the parents there! Even the Spanish mom was very upset that her son is not learning much in Arabic. She even proclaimed that her son's Arabic level is wayyy better when he was in KG. Which, I couldn't agree more! We first asked whether we can put Aaron in an Arabic-speakig class. Most of the students can speak English very well so I don't see any problem for Aaron to communicate with his friends. And apparently these classes have no problem with their Arabic teachers. I also want him to learn Islamic Study. Yes it would be a big challenge for me to explain to him again to ensure he get the right info but I don't mind at all... But it seems impossible to them, because if not they had already done this last year (We've been asked since Grade 1). So. yeah, putting him into Arabic-speaking class is our Plan B. We discussed this with Aaron. Last year, he was OK to change class. But this year, he declined. I understand why. He's already comfortable with his circle of friends. They've been together since last year. Now this is another battle to tackle. Our kid's psychology vs. his best interest. We are quite happy with the other subjects. The homeroom teacher is OK (so far). Aaron is happy to go to school. And we still have to wait until next year (at least next term) due to financial agreement. So hmmmmm..... But husband is thinking about changing school right now. What do you think? What's so big about learning Arabic and Islamic Study? It is just personal preference with reasons we have in mind. And this school isn't cheap man, they made us pay for it. And we are in a right place to learn Arabic first-hand. So why not? Plus if in the future we have to change country or school, if his level isn't at par with the requirement for that particular Grade, than that would be another problem. 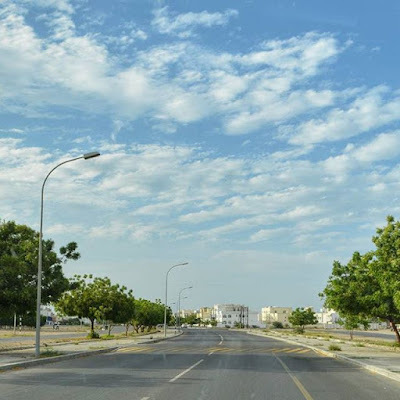 During my early days staying here, I didn't know much about the life and culture of the Omanis, although we live in an area where I can consider as local area because 95% of our neighborhood are local people. According to my husband, most of our neighbors are senior government servants, hence the laid-back and safe atmosphere. Although I don't know most of my neighbors (the wives mostly spend their time at home or work or outside with friends *you would only see housemaids running errands and escorting small kids to the playground* and some of them don't really speak English, and I am also an introvert that stays at home most of the time), but they are OK. Well, at least nobody has ever bothered us. Honestly, at first, I preferred to live in The Wave (about 10 mins driving from our house). It is a high-end residential area where most of the dwellers are expats (mostly the Westerners) and modern Arabs. 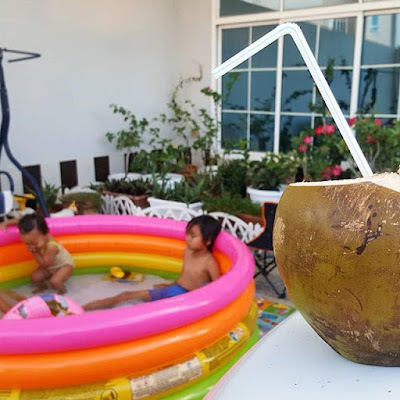 I like the place not because of that, but because of its accessible facilities (Private beach, playgrounds, grocery store, gym, pools, and a lot of eateries all in one place). The only constraint is, of course, the budget. Haha. Sorry to reality, we are not that rich! (not yet, one day inshaAllah!). But then... I came to realize that, the kind of life I am having right now is actually the best for our family. Basically, the environment here is similar to our childhood era (back in the late 80's or early 90's) where we were free to ride bicycle to our friends' houses, walked to the small shops nearby and happily play outdoor games with friends all day long and only went home at Maghrib time. We have nearby playground with a very basic facility but enough to let the kids enjoy their afternoon. We have small stores across the street where I don't really buy stuff there but is surely handy whenever I suddenly realize that I ran out of eggs, or milk. (but I hate it when the kids especially Saraa crying for ice cream that she can just watch from the window to see whether the shop is already open). Somewhere in 2015, our neighborhood. Photo taken from the window. A kampung environment, only no wooden houses here. Because, they don't built house using woods. And the best part is, I loveeeeee to see the local boys with their dishdasha (man's traditional attire/dress/jubah) marching to the mosque in front of our house during every prayer time. They are as small as 5 or 6 to teen ages and they go there by themselves, without having to wait for their father. It is simply a pleasant scene for me. The number will increase during school holidays and Ramadhon. And even ramadhon, we will see cars filling up the side road even during Fajr and noon prayers. I learned that they can sometimes be really naughty. I saw once or twice they threw medium sized stones to each other as a game, on the way back from Solat. And yes they sometimes can be very harsh and loud!. But I love the fact that here, they teach the boys to go to mosque during prayer times, irregardless! And when Azaan Maghrib, they know to go home. It is just like a kampung life style, isn't it! Actually, not all residential areas are like this. There are places similar to Damansara, Bangsar, etc, in terms of its convenience and density. I only refer specifically to our neighborhood. But overall, we Malaysians agreed that in general, the safety here is better than in Malaysia. I guess I would never experience this if I stay in the expats' area. I am thankful to have this opportunity. It is a life lesson and indeed an experience worth to keep. But if my husband ever ask me again whether I want to move to The Wave or Madinat Qaboos and the likes, I would definitely say Yes! Hahaha. Well, at least I can learn something new over there right?! Overall, I am just thankful and grateful. Our house is still easily accessible to a lot of places: 3-5 mins to Muscat City Center Mall and hospital, 5-10 mins to Vegetables and Fruits Market that sells our favorite coconut juice, 10 mins to The Wave for eateries, 10 mins to beach, 15-20 mins to Wadi Al-Khoud (ala-ala river), nearby to the best mishqaq stall (traditional zanzibari skewers), 5 mins to Sahwa Park- a big public park with a lot of flowers and playgrounds and most importantly, only a few steps away to the mosque - rajin tak rajin je orang lelaki dalam rumah ni nak pergi! hihihi. A Little conversation about almost everything! The urge of keeping this as part of your childhood memory is compelling and I think this is quite good since we don't really have close conversation between just the two of us since the day you arrived from your Spring holiday in Malaysia (alone). I love to have conversations with you because I love the way you ask questions and trying to understand the whole topic. I don't mind scratching head to answer your tricky-yet-honest questions because I know you will eventually get the point and I always satisfy with the way you comprehend to my explanation. Alhamdulillah. Like tonight. you couldn't sleep despite the tiring 3-days and nights full of activities. Hence, our bedtime routine became a little too long as we went into (seems to me like) a very serious, never ending conversation. Aaron: Ummi, I can't sleep coz I am afraid. Ummi: You should not be afraid of shaitan. Shaitan is just one of Allah's creation like you, me, Hawwa, trees, ocean, etc. So why do you afraid of shaitan? Aaron: (interjected before I finish) I know I know. I can fight shaitan! Erm.... How? I forgot... Oh yes... I have to pray! Ummi: Yes, and memorize the quran. That's why you have to read quran and memorize the surah. Aaron: But why shaitan afraid when I pray? he will go far away right? Ummi: Because shaitan doesn't like when you pray to Allah and do what Allah asks you to do. Inshaa Allah, if you pray to Allah, Allah will protect you from shaitan. Aaron: Ummi, Allah creates shaitan? Aaron: When did Allah create us? When we're born? Aaron: Worm? is it good worm or bad worm? Ummi: Its W.O.M.B its a sac. You know sac? Aaron: I was there too when I was a tiny baby? Why baby stays there first? Aaron: How does baby go out from the womb? Ummi: Allah will make a way for it. There will be a tunnel and a hole to let the baby out. I was about to say it but I didn't hahaha. Aaron: I can't see it right? Ummi: It is not important for you to see it now. Aaron: Errmmm....But I can't see Allah too? How is Allah looks like? Ummi: I don't know how is Allah looks like. I can't see Allah too. Aaron: But you said we can see Allah after we die and after we alive again right? Ummi: Yes. You want to see Allah? Aaron: But then, where is Allah now? Aaron: Is Allah in the outer space? Aaron: Oh is Allah outside the earth? Ummi: Yes. OK the most important thing is, if you want to see Allah, you must be a good boy OK? The conversation didn't stop here. There was some discussions about how when you use your brain you'll become clever and vice versa but I think it's going to be too long. I don't know how on earth a 6 years old boy can bombard questions non-stop. He didn't even pause long from one question to another. Well I guess, because he's a kid hence he is still full of wonder. I bet most of us (moms and dads) have been in this situation right? They want to know everything so instantly as if they are going to sit for an exam! Oh Allah please bestow us with wisdom and patience in raising our children. Ameen! "I only need 2 weeks in Kyoto to see the beauty in it. But it took me 2 years to do the same to Oman"
That was my testimonial on my second year living in Oman. Perhaps I took too long to adjust. Or maybe I focused so much on domestic issues like (the most obvious) how people here tolerate patience and the F1-excellent-driving skills they have! Here, getting honked by vehicle behind you right after the traffic light turns green is just like music to your ears. Watching people quarreling about a parking spot is also normal (We have had an experience with a very very rude parking lot steal-er too!). Oh, the most ordinary scene here is that you'll find gigantic-expensive vehicles parked ON the pavement/sidewalk. Also, people here multitask a lot during driving! I wonder whether or not they notice that their expensive cars are equipped with bluetooth app for hands-free! Well, if I were to compare between Muscat and Kyoto, that is so not an apple to apple comparison. Like, come on! We all know that Japanese are among the most discipline people in this world. You nak compare with the arabs? Hahahaha - evil laugh (I hope no arab ever read this). But if you want to compare between Oman and our beloved country, and Omanis and Malaysians, that one sure can loh! But to tell you the truth, Oman is actually the nicest country among the GCCs and other Arab countries! This tagline is made to advertise Oman for its tourism...And yes it is true. 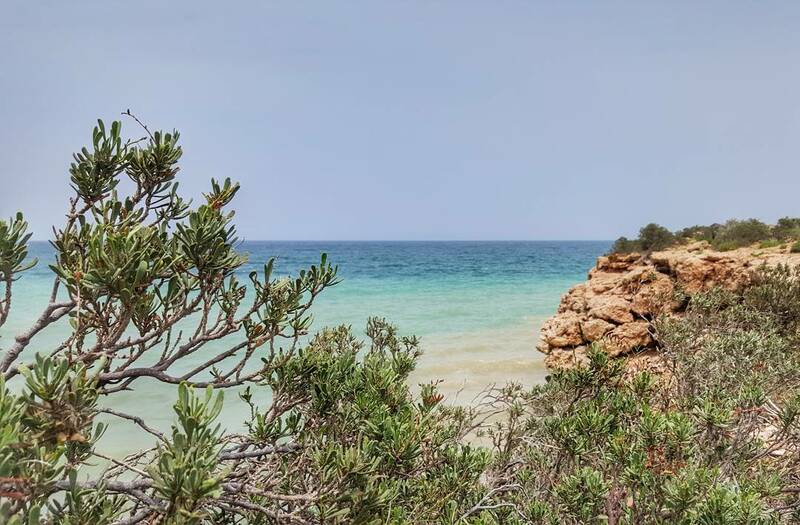 You can find beaches everywhere, even in Muscat (the capital of Oman). They are open beaches so do not expect for any toilet or changing rooms. The beach nearby our house is actually a fishermen's area but it is till nice and people still come for activities. They are also some beaches that accommodate recreational purposes such as for picnic, BBQ and gatherings, hence some simple huts were built. Recently I went to Surr (outside Muscat). It was about 2 hours driving from home and we were simply entertained by nature along the way! Oh I love the ombre colour of the beach, the coastal, different colour of rock mountains, and even the goats, donkeys and camels that contribute to spectacular nature scenery. this photo was taken on our way to Sink Hole. just the beach along the way. Other than beach, Oman is famous with its wadis (a valley that is dried at most place but has small amount of water stream). People love to do wadi bashing or camping there. However, during rainy days, wadi can be the most dangerous place for people. Mountains are also popular as tourist attractions. We have two most popular mountains, which are Jabal Akhdar and Jabal Shams. And not a lot of people know Oman has cherry blossoms in Wekan Village. Though you have to do some off-road and walking a few kilometers to reach the destination, it's all worth the effort! 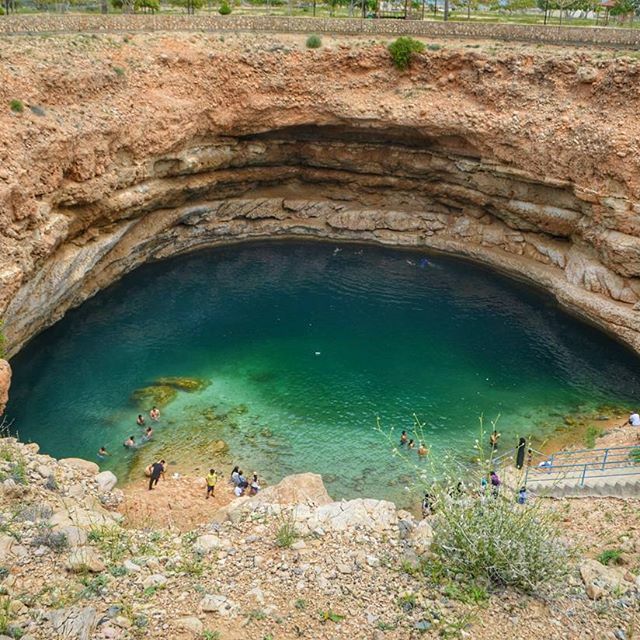 There are other beautiful places to visit in Oman such as Salalah, Nizwa, Wahiba Sand, some villages and whatnot. But one can only appreciate this country and its nature if you are a nature lover. If you love shopping, tall building, etc, than this is not the place for you. Oh anyway, you will not find sophisticated buildings in Oman, even in Muscat; its capital city. Most of the buildings, especially the government offices, still preserve the Arabic architectural at least to its minimum level. And Muscat is a clean city. Truthfully, it is not because of the people here. If not for the municipality, I don't think this place could be this clean. But I salute the government for taking cleanliness as serious issue. Oh my, what a formal essay! When I re-read this, I imagine myself holding a hailer in front of a bunch of old people with cameras and maps in their hands (tourist laaa), and reading this outloud! Urghhh... my writing is getting worse, and so does my language skill! OK. Do you remember the life story of Prophet Yusuff from the day he received the dream until the day he was being reunited with his father and brothers? Do you remember the obstacles that Yusuf (AS) had to endure along his prophet-hood journey? Please read the translation of Surah Yusuff so that you will understand how is these 3 ayaahs (12: 4 - 6) relate to the whole surah, and relate to the best fundamental parenting tips we can benefit from, inshaa Allah. In the meantime (to not make this post look unfinished, hehe) lets review the significance of this ayah. This is the ayat about TAUHID, about Allah, the ayat that Prophet Ya'qub taught his son, the ayat that had built faith in Yusuff. Short and simple word, BIG impact! Yusuff was a small boy when he was abducted from his father. Now, imagine our small child at the age of 5, 6 or maybe 7. Imagine if someone kidnapped him/her, or bring him/her away from us. Nauzubillah min zalik. Yes, even to imagine, we simply can't! But this is what had happened to Yusuff (AS)! But Yusuf had a proactive father that gave him wisdom even from a young age. 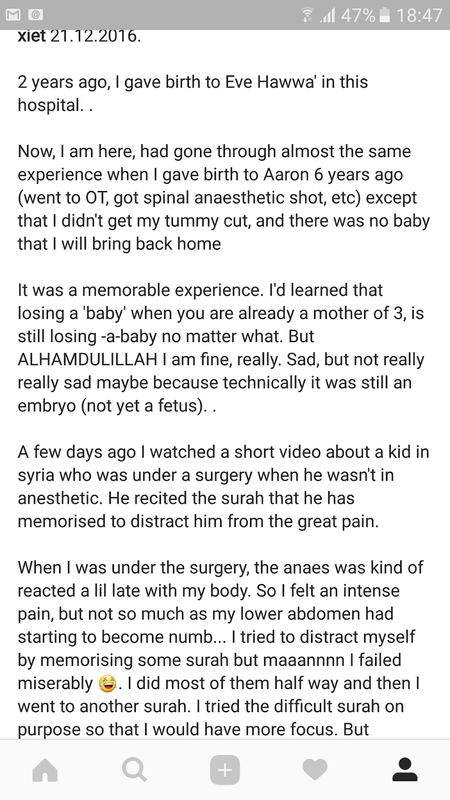 Because of that, by Allah's will, Yusuff survived the tests. When he was all alone, in a dark, at the place where he thought nobody would know he was there, indeed. Allah knows! He is all-wise! Then he was brought away from his country, a foreign land to him. He must had been scared, and his father didn't know where he was, how he was, and he was all alone, but no, he wasn't alone, for Allah was with him, and Allah is all-knowing! When he was tested with an attempt of adultery, where nobody was around but only him and a woman who was willing to surrender everything for him, while he was a young man with desire, he chose to ran away. Indeed, he knew, Allah is all-knowing. Allah is 'Alim, Allah is Hakeem! And then when he was imprisoned while he was innocent, yet nobody helped him and stood up for him. Did he feel despair and hopeless? Indeed, he knew that Allah knows, Allah is 'Alim, Allah is Hakeem! This, many audience broke into tears! Allah is so close to Yusuf's heart. He has strong faith in Allah. And who taught him that? His father. When? when he was just a small kid! If we think our kids are still small to understand, and we don't make an effort to even try, how can we sure that when our kids are in their teen age; the age full of wonder, desire, and bravery, they are capable of restraining themselves from the tests? How can they have Allah in their heart?! #6. The teaching of kind heart and forgiveness. During the end of the story, Yusuff was reunited with his brothers and father. At that time, he was a minister in Egypt, his brothers came to him for protection. What did Yusuff do? Despite what they did to him around 50 years or so ago, he forgave them! Yes, Yusuff forgave the men that abducted him and separated him from his beloved father and brother (Bunyamin). Surah Yusuff, verse number 100. Yusuff (AS) said that Satan induced his brothers. He forgave his brothers, because he knew his brothers were under the influence of satan. He blame the satan. Remember we talk earlier about effective communication? Now... even after 50 years, Yusuff (AS) still remember the teachings of his father. Most of us remember Yusuff as a handsome man. That is what we've been taught since small. But little that we aware that he is not just a good looking man, but also a man with good heart. He held no grunge against his brothers, and other people that cause trouble in his life. #7. Our children are our assets in the hereafter. This statement is debatable but let just be positive. Sheikh talked about the famous hadeeth about 3 deeds that benefit us even after we die; 1) Our continuous/ongoing sadaqah (donation), 2) knowledge which is beneficial, 3) The prayers from our pious children (HR Muslim). Guide our children the Islamic way. Teach them manners, and do not be overprotective towards small things (i.e. let our kids know about responsibilities, knowledge, etc). Let them make mistakes through learning while we are around so that we can correct them. If we are too afraid to see them make mistakes through life lessons, how can we correct them when they make mistakes while we are not around anymore? Prepare our children to be among the pious mankind, and may we have the benefit through the prayers from our pious children when we are gone. I am so sorry I am not a good narrator. I think for a better understanding and knowledge, you can watch Sheikh Sjid Umar's lecture on Youtube. I am sure you can benefit more knowledge first handed. As for me, even after almost a month attending this lecture, my heart throbs when I imagine how Sheikh delivered his speech. Very powerful, and emotional. And I realize, there are a lot for us (my husband and I) to improve.